If you look at the cross-section of an airplane wing, the airfoil, it has a teardrop-like shape. One reason aeronautical engineers use this shape is because it has low drag. So if you create a big, wooden box, shape it like an airfoil, cover it with aluminum, you can pull it down the highway with a small car and good gas mileage. Yeeeeeeeeeeeeehaw! That is the idea behind the Teardrop Trailer, a travel trailer (camper) design from the 1930's built out of large sheets of plywood, which was a relatively new material at that time. After WWII, people actually started building them out of old military parts. To some people, there is a "kitsch factor", as any kind of trailer is considered low-brow. To me, the word kitsch is like the word tact, it has no meaning unless you overlay a fairly elaborate context. To understand kitsch, you need to understand the context of a certain socio-economic class (which usually means that you must be a member of that class in order to obtain this context). To understand tact, you need to understand the context of the expectations of another individual (which usually means you need to be of like mind of that individual to obtain this context). Kitsch means you "inappropriately" combined art. Tact means you "inappropriately" combined actions. I have always taken an outsider's viewpoint, though, and I see grotesque zones at many levels, but teardrop trailers are not one of them. It was eventually given away or sold at a garage sale, I can't remember. But, over time, I missed that object and questioned my judgment--there is nothing in this world that states that dissimilar human ideas or cultures cannot be joined. In fact, that is the very basis of human creativity and innovation. That vase had incorporated within it, the union of TheCircleAndTheLine, and the object it emulated was more than just a sports ball, the football shape maintained aerodynamic stabilization through gyroscopic rotation, like a rifled bullet, and had a symmetry, like two back-to-back teardrops. When the object lands, it bounces in a seemingly random manner. Think about this--order in the air, disorder on the ground. It is a very interesting shape. On season 2 of Stan Lee's Superhumans, they filmed Alex Tanney (now an NFL player) throw a football with amazing accuracy. It was unbelievable, actually. It reminded me of the superhuman shooting ability of the late Bob Munden in season 1. I am neither a football nor shooting fan, and I don't really pay attention to spectator sports outside of the Olympics, but to see people in Western civilization do something magical that we westerners normally associate with the Far East tells me that civilization and culture is not a barrier between people and the Universe. The Universe interacts with each of us directly. To merge a football and a vase is therefore beautiful, if we replace our trivial contexts with a universal one. I live near a chinatown↗, and when I go to grocery stores there to look for food, since I see things that I haven't seen before, for example, I only have a basic idea of what I am buying. Nobody is there to translate things for me, so I just go on what I do know--the appearance, function, ingredients (if listed in English). I am buying things without knowing their true source, composition, function or appropriateness. Ignorance, if through innocence, is not necessarily detrimental. But not being aware of our ignorance is. At one time, the automobile itself was seen as a tacky contraption. Now it is seen as a stylish symbol of wealth. The teardrop trailer is a space capsule, just not for outer space, but for earth space. A teardrop trailer is pulled behind a vehicle, moving horizontally, and has an aerodynamic shape. In this case, the vehicle is a car. A space capsule is pushed by a vehicle, moving vertically, and has an aerodynamic shape. In this case, the vehicle is a launch vehicle↗. If you look at the shape of modern space capsules↗ today, they still use the same "blunt body" designed by NASA engineer Harvey Allen↗, the originator of blunt body theory. 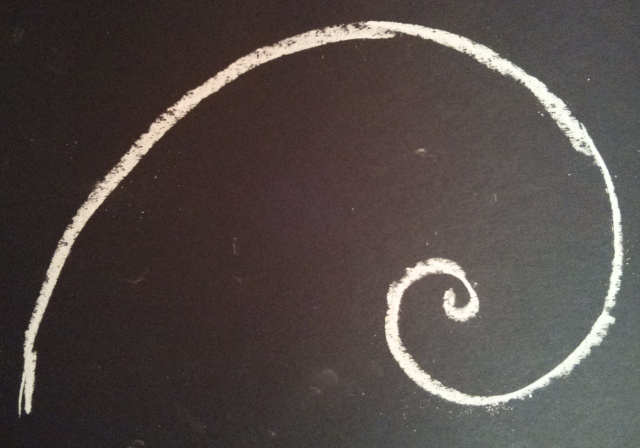 But the teardrop trailer, in my opinion, does not derive its beauty from the "teardrop" shape, it derives its beauty from the Golden Spiral, a representation of Phi. For whenever I have seen beauty in things that some people do not, usually there is a mathematical underpinning. My favorite animal for a long time has been the bison, or American buffalo, and I also like birds. But I never knew why I liked the shape of a bison until, during the writing of this web site in 2014, I noticed that in certain poses, the male bison's body fits nicely under the golden spiral, and its eye near the center of the spiral. In my mind, there is something extremely beautiful in shapes derived from natural physics that artists appropriate in their designs. So... what was that tacky box on wheels again? In 2014, I built a new vessel sink for my bathroom. 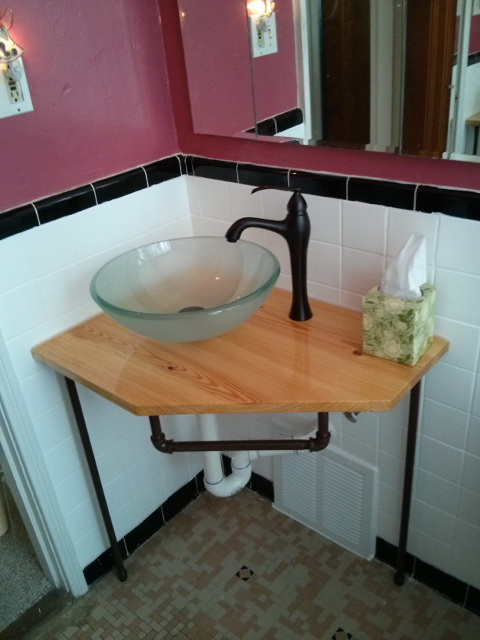 I tore out the old vanity and created a sink out of yellow pine with polyurethane. I spent a lot of time debating how to build it. It is a depression-era house, and I didn't want to break holes in the ceramic tile walls and mortar to find the studs to hang the sink from the wall. I also wanted to open up the floor space and didn't want a large vanity or pedestal in the way. So I found a compromise, an interesting shape that was most efficient for the task. I used black iron pipe, the kind of pipe typically used for natural gas lines, as legs, but I only used two legs and coated them with brown enamel. Unless you use some kind of robotic, inverse pendulum mechanism two legs are inherently unstable. But I took advantage of the fact that I had a corner, two walls at 90 degrees, and set the weight of the vessel bowl slightly off-axis from the legs, so the sink tilted slightly against the wall. Because of the 90-degree walls, I only needed very light L-brackets to attach the sink to the walls, since the forces would either be compressive (against the wall) or shear (through the screws). This makes it stronger than it looks. It is, in more ways than one, "balanced". But as far as being consistent with the design movements that inspired other areas of the house over the decades, who cares? The movements themselves were significantly derived from the technological or economic constraints at that time. If the design was so good that it still has use today, like the teardrop trailer does 80 years later, and if the economy and environment can sustain them, then there are still valid reasons to continue to make them. My grandmother, when she got older, got rid of her heavy glass, ceramic, and lead crystal cups and drank from a plastic cup. When she was young, plastic was not available, and it was colorful, lighter, and unbreakable. It had superior properties for what she wanted. But because plastic was inexpensive, it was frowned upon. Today, our radically income-disparate society segregates itself through materials and designs that do not necessarily have superior properties, but are just too expensive for most people↗. It is like what happened to quinoa↗, a food of poor farmers that suddenly became too expensive for them to eat, which is now found served at expensive restaurants. If people can't stratify each other through knowledge or technology, they will unfortunately do it monetarily. The maker movement is a response to this, and sites like Etsy are making some of these products available. Like me, people have found ways to use cheaper materials in unique ways↗ for both art and utility. I tried to balance the cost, appearance, and functionality. A lot of people don't like vessel sinks, but the vessel is actually larger than my old sink, at a more comfortable height, and there is more counter space around the vessel. The sink is simple and functional. It is a minimalist design, like the teardrop trailer, and like a lot of the computing projects I have been working on recently. Vessels themselves also form part of my interest in water. When I was young, I worked on a few designs for elaborate snow forts that became more and more complex, and decided that I needed to build my snow fort out of sheets of 4×8 plywood. I fantasized about living out in the yard in the wintertime in this fort, with a heater, snacks, and my Commodore64. Around the same time, I actually tried building an underwater diving bell↗. I bought a plastic trash can to invert and use as the bell chamber to create an air bubble, and created air tanks from 2-liter soda bottles using punching balloons and garden hose as an air bladder and tube. I built ropes and weights to hold it to the floor. I planned on using an air pump and hose to create a base station air pocket and then use the air tanks to swim from the base to underwater destinations and then back to the base again. In a way, I was subconsciously designing sensory-deprivation chambers, blocking out most of the world to replace it with my internal reality. Hyper-systemizers, similar to autistic people, frequently move inward and create such small spaces. All of these ideas were early forms of spaceships or space capsules (although I have to question if my addition of snacks actually turned them into "mancaves"). This is an engineering challenge, but one with readily available materials found at any home improvement store. Some people buy pre-built trailers, but for me, that takes most of the fun out of it. I also used to build model vehicles when I was young (rockets, cars, and airplanes). I built them from the components (cardboard, wood, metal, plastic, and rubber) and some of the radio-controlled ones were fairly complex. In those days, you could not purchase them ready-made. Light, high-energy-density batteries and neodymium magnets were just being invented and were not available. In a lot of ways, teardrop trailers are just model vehicles on a larger scale, using much of the same construction methods. I taught myself how to repair real automobiles after I first learned how to drive when I was 16, and many of the principles were indeed the same. One of my favorite films is the 1965 version of "Flight of the Phoenix" where a German model airplane engineer rebuilds a real airplane to escape from a crash in the Sahara desert. He was criticized by the pilot (played by Jimmy Stewart) and passengers for being a "toy" airplane designer, but he insisted that the laws of aerodynamics were the same, and he was right. In the original Speed Racer series, I liked watching Speed drive around, but I liked the scenes with Pops and Sparky even more. I wanted to find out how the Mach 5 was made. One of the most upsetting episodes for me was the one where the plans in the windshield of the Mach 5 get destroyed. I like the outdoors, but I'm not an outdoors person. That is confusing to a lot of people. I've been a distance runner most of my life, and have done long trail runs that overlook the bluffs of the Missouri river. I did a lot of my running on the flood plains of that river. I fished in a boat with my grandparents. When I was in the scouts, I built fires, built a survival lean-to, whittled, and fired rifles. I camped overnight at Cahokia Mounds, in-between ancient Mississippian Mounds in dense rain which had flooded our tent. I did a little rock climbing and swam in the Eerie Canal with my college friends. But I always travel to and from a "base station". I don't like being away from my base station too long. I'm the type of person that would rather be sitting in a chair, piloting the space ship around Mars, communicating with Mission Control, performing experiments. An outdoors person is the type of person that is hiking around on Mars, getting infected by a new strain of organism and hallucinating while some kind of animated plant tightens around their leg. We both have our own experiences of the world. I don't need to put my hand in Martian sand to understand what Martian sand is. I trade some of my sensory experience to allow time to think and reflect. Without reflection, my experiences are meaningless. Sometimes I wonder about Michael Collins, the 3rd astronaut from Apollo 11 that you don't hear about as much as Buzz Aldrin or Neil Armstrong. That's because he never set foot on the Moon. He stayed up high in the Command Module, orbiting the Moon alone in the ship, but was of critical importance in getting the others to return alive. If I had just left the Moon, an airless desert of death, knowing Michael was on the ship, that he was there to greet me and take me home, it would have been a wonderful feeling. Michael, in a way, is the Dave Bowman from 2001: A Space Odyssey. While Neil was taking one giant leap for Mankind, Michael's presence orbiting above was also a representation of Mankind, that Mankind is what made it possible for Neil and Buzz to set foot there. Perhaps that is why I created my own HAL 9000, so there is someone, or something I trust, that is manning the outpost when I am gone. One of my favorite books when I was young was "My Side of the Mountain". I read it 3 times. In the book, the main character made his base camp, in solitude, in a tree trunk. I also liked the movie Jeremiah Johnson. One of the first things civilized man does is to build a substantial structure. Even primitive cultures do this. And nomadic people generally build significant ones as well. Bedouin tents are significant structures for camping in the desert (reminiscent of something the Weasley's used in Harry Potter). The Romani wagons were elaborate precursors to the teardrop trailer. I was also a fan of "Land of the Lost" in the 1970's, and they kept retreating back to their cave each episode. That is also why I liked shows such as Farscape. The living ship, Moya, was their base. It really bothered me during the shows where the cast couldn't return to Moya before the episode ended. That I why I have always liked the Gateway Arch, it is a representation of many of these ideas, and is also like my tower home in the sky. It is a substantial structure that you can walk inside, covered in stainless steel, and its shape is derived from the catenary, the most mathematically efficient shape that a chain hangs under its own weight. But the Arch is not a perfect catenary, and it closely resembles the binary entropy function↗ in information theory. 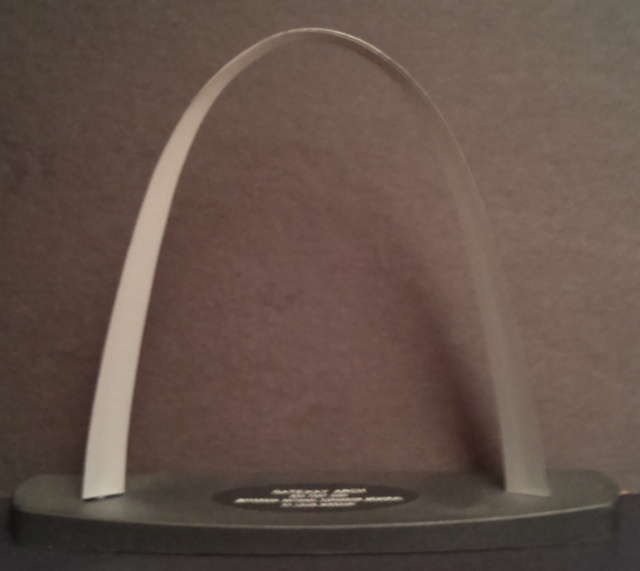 In the late 1980's, my father brought home a tiny aluminum model of the Gateway Arch that he bought at a bazaar in Iran. He bought many things at those bazaars, such as those in Isfahan↗ and much of the objects are filled with beautiful shapes and other mathematical designs. The base had broken off and only the metal arch remained with a couple of empty screw holes. Knowing first hand what it was, he asked the old man selling it if he knew what he was selling, and the old man shrugged and had no idea. To him, it was just a curved piece of aluminum. My father then purchased it from him and flew it back to us on an aluminum airliner. He realized there was something special and significant about the whole chain of events.